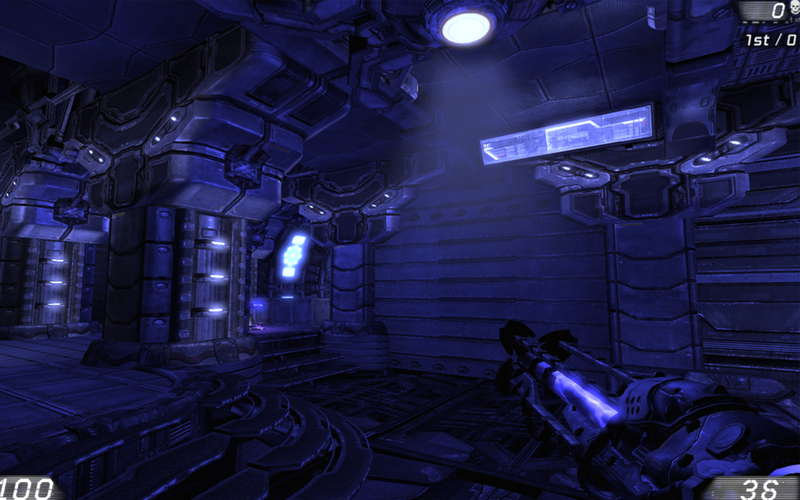 Tyron is a small, two to eight player, Unreal Tournament 3 deathmatch level. It supports both traditional deathmatch and team deathmatch rules. Tyron is a space station currently orbiting a dying star. Scenes of this star slowly enveloping nearby moons and planets create a dramatic backdrop that can be seen from the upper decks. The final level was released on the Epic Games forums to positive feedback. It's even on a few server rotations! Tyron aims to create an dynamic and varied gameplay space through the use of verticality, map flow and interesting sight lines (glass floors). With Tyron my goals were threefold; to gain and improve knowledge of the Unreal Engine, the process of designing a level from documentation to completion and to create a highly polished map with good flow and interesting map play. The overall map of Tyron is comprised of two distinct levels. The lower and upper floors overlap to provide a vertically interesting gameplay space. 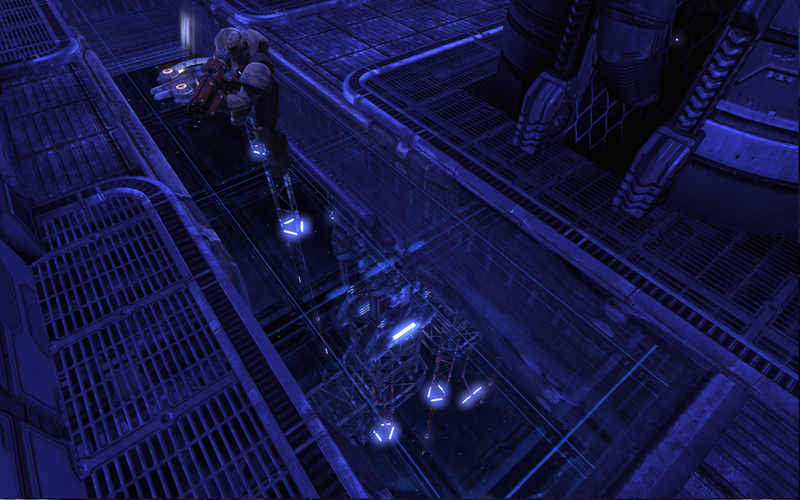 Glass floor-panels in certain areas can be used by players to gain a tactical advantage, as there are multiple ways to see other players and pick-ups in the engineering tunnels below from the upper deck. As a main design task I wanted to accentuate advantages and disadvantages between the upper and lower floors of the map. To achieve this I placed some powerful pick-ups (such as the armour vest), ammo, and the majority of health on the lower floor but gave the upper floor additional sight lines through the glass to see players below. It becomes a risk/reward dynamic and creates meaningful uses for every section of the map. The rocket launcher was placed in the middle of the upper floor to create a central hub for the action on this floor, and indeed map in general. With Tyron I chose to focus on a smaller area with circular flow, there are no dead ends, giving the player a freedom of movement through the map at all times essential to deathmatch multiplayer. Based on the design sketches I began by blocking out the spaces in the map using BSP, starting with the central hub room. During the initial block out stages, areas where glass floors were eventually to be placed were cut away. 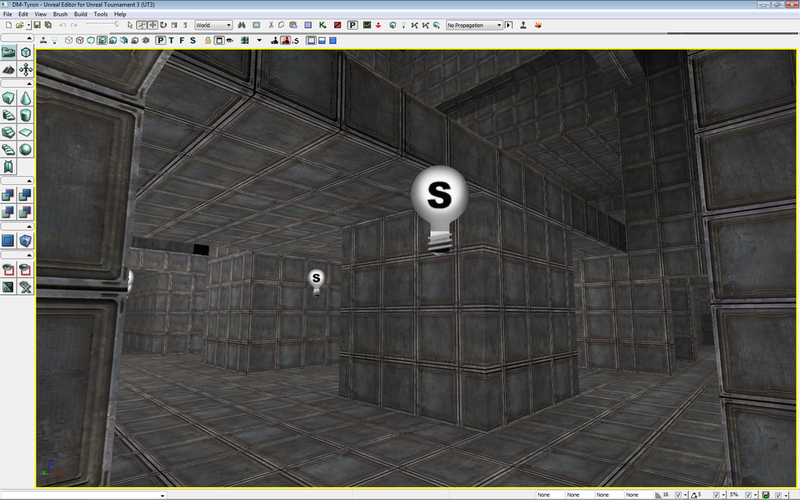 This allowed me to make small adjustments to the level layout based the sight lines that were created. The corner that would form the primary lookout over the exterior environment provided early challenges. It was a balancing act creating space for the lower jump pad hole whilst leaving ample room for the sniper corridor walkway. 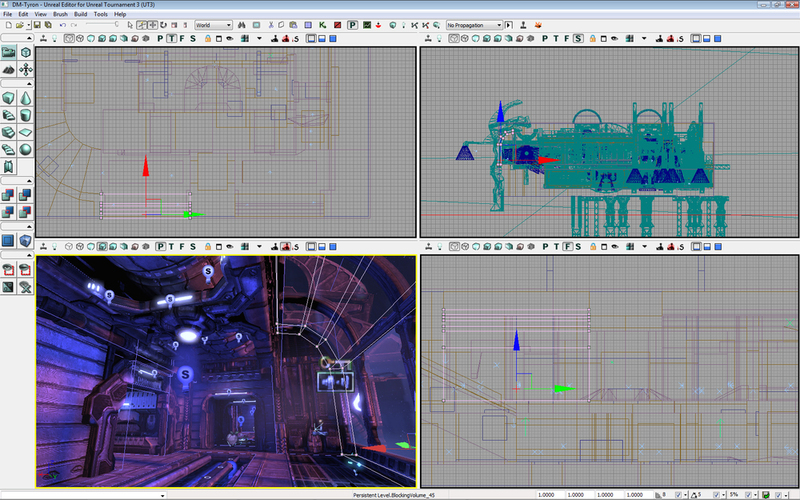 I blocked out the engineering tunnels next, this area needed to feel confined while still providing room for dodging. 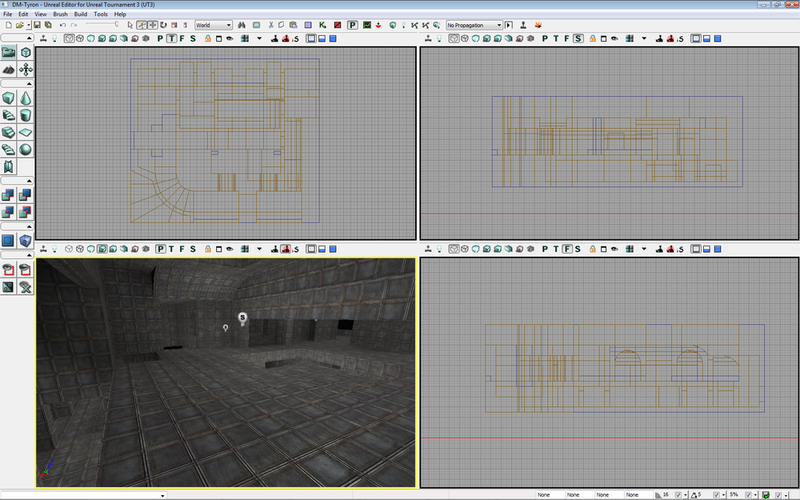 I kept much of this area on the editor defined grid. The next step was to place all the pick-ups, AI pathing nodes and spawn points the level needed to be playable in a rudimentary state. Getting the map functional early was a top priority. Playtesting the map early allowed me to start refining the gameplay. 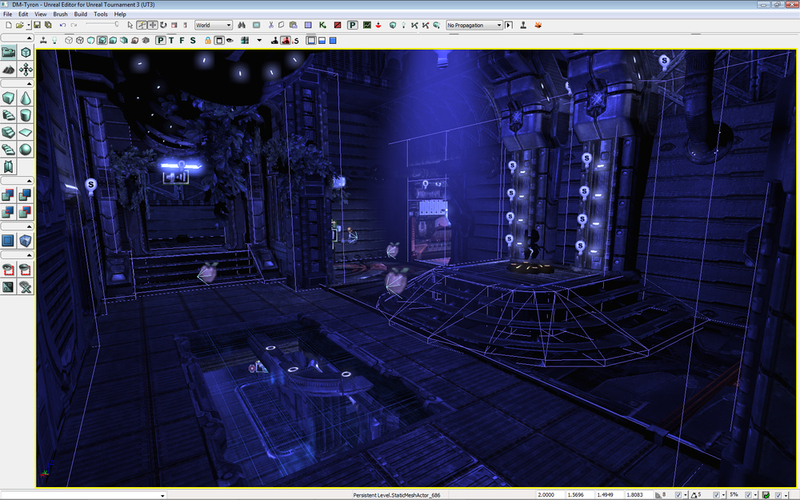 There were numerous small tweaks at this stage in the level's development process. Much of them revolved around balancing the pick-ups for both the upper and lower floors. The major armor pick-up, the vest, was moved to the lower floor to draw players. Without it, this flaw lacked a vital draw card given all its disadvantages. A wall was added to separate the two main upper floor rooms. The area in the original design felt much too open for a level of Tyron's size. The shin pads (medium strength armor pick-up) were a constant point of debate, they were removed and added in again several times. Without them this room lacked a compelling gameplay reason to exist, plus they added an interesting extra objective to the upper floor beyond the Rocket Launcher spawn, and thus they were eventually included in the final design. 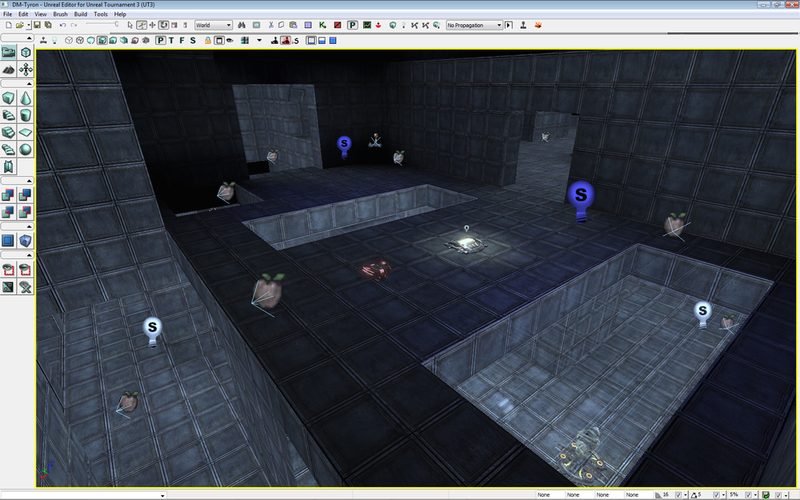 After refining some of the spaces in the level, and tweaking the pick-up placements, it was feeling good to play. I moved on to developing a visual target; what was my visual quality bar for this level? This was the final visual target screenshot I took. I deliberately kept the lighting rather saturated at this point as the neon effect complemented the overall atmosphere. I started adding more static meshes to the level, working slowly outwards from the area where I had created the visual target. I tried to create prefab sets of meshes that could be reused across the rest of the level - door frames, lights and pillars. As part of the meshing process for Tyron some lights were added, especially in the sections of the level that used repeated assets. The observation deck was one of the most involved areas to create in Tyron. Some additional meshes were added to create the outside hull of the station. Players could see this see when they pressed up against the windows, I felt that small details like this were well worth the time investment. The exterior environment came together surprisingly easily. I added the texture for the star and used a rim shader to color the edges, giving it an almost otherworldly look. A simple animation was added to the swirling fog at the edges which helped sell the scene further. As a result of the exterior environment coming together, I added some glass floors into the lower deck. Aerials were placed on the underside of the space station that can be seen through the glass. These glass floors on the lower deck provide a WOW moment the first time a player sees them. 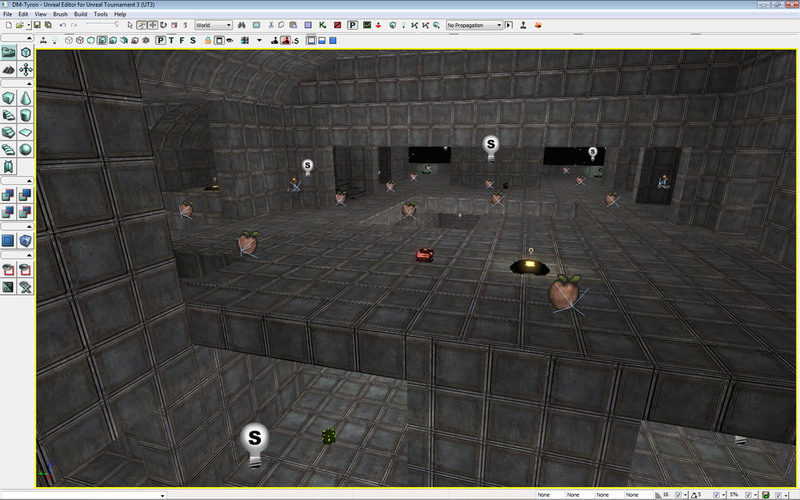 After further playtesting on the level it became apparent that blocking volumes would need to be added, as players were getting caught on small mesh protrusions. Using big shapes for the blocking volumes allowed me to ensure extremely fluid movement through complex spaces like this corridor. Blocking volumes were used extensively throughout the entire level from this point forward. This room went through some of the most iterations. 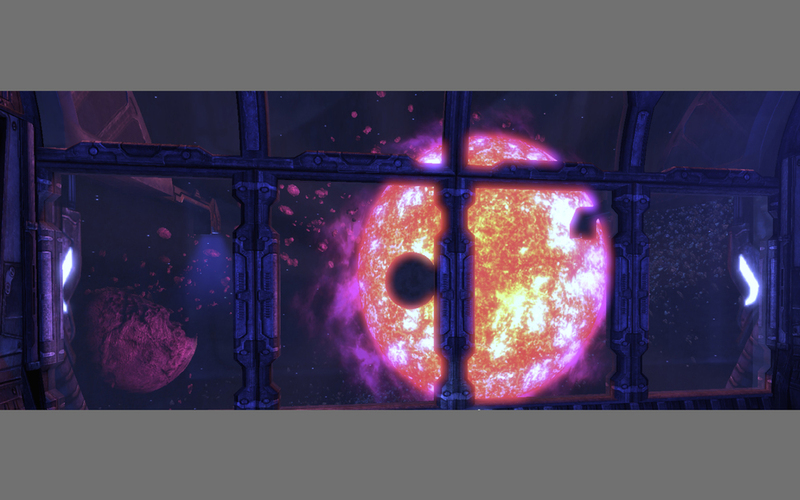 Particle effects were added to the level; steam from the vents, sparks from burnt out lights/cables and some exterior asteroid effects. I added some custom warning effects and sounds to the consoles throughout the level. 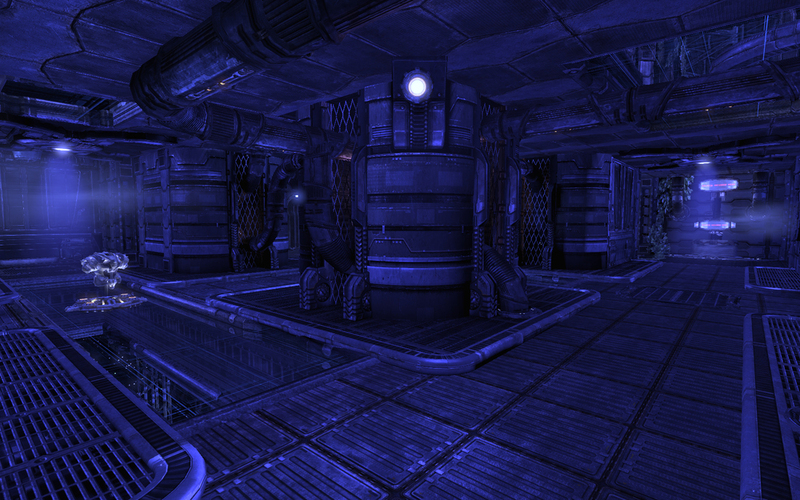 This was a cheap way of adding additional atmosphere to the environment. As a final touch I added an animated holographic display above the Rocket Launcher spawn, further reinforcing this room as the hub space.